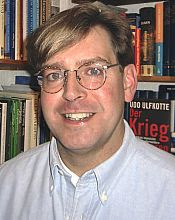 Udo Ulfkotte, during the summer of 2007, sued a number of German Bloggers for qualificating him as a coward, a racist and an opportunist. Conjointly with his organisation "Pax Europa" and its treasurer who is also his spouse, he demands from four or five bloggers more than 200.000 Euros as indemnification. The German Courts have, at first instance, accepted his complaints and have ordered provisional interdictions to the incriminated bloggers. All those bloggers are from the "left", or, at least, anti racist thinkers and activists. 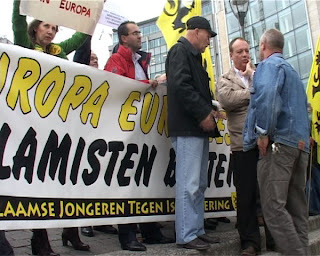 Now, after his desertion from the Brussels' Sept. 11 demonstration and after his denunciation of the former allies from the Vlaams Blok and from SIOE as "racists" and "extreme right-wing", he is being attacked personally and vehemently by the "right". Is Udo Ulfkotte exercising dhimmi-status? "Dhimmi" is a very heavy qualification in Ulfkotte's and SIOE's world. Dhimmis are non-Muslims who, passively or actively, compose with the enemy. Traitors, for short. This [remaining in contact with SIOE-chiefs, HR] was never the case with Udo Ulfkotte. Although he corresponded with Anders fairly regularly he was never fully forthcoming with any news regarding contacts, for example, or interest shown by the media. Ulfkotte is not a team player in our opinion and this has been shown to its extreme over the last few days with him appearing on media outlets, especially in Belgium, saying HE cancelled the demonstration. He could not have done a better job of trying to make the court case fail to reach a verdict in our favour and undermine SIOE’s lawyer’s attempts to reinstate the march. We regard his behaviour as despicable and we both regard Ulfkotte as a Judas to the cause of anti-Islamism. We regard his conduct to be calculated in making the demonstration fail. (Some emphasis is mine, HR). Here, Ulfkotte is indicted for treachery, misleading people who were dependent on his informations, and, worst of all, intentionally sabotaging efforts to legalise the demonstration. He is regarded as a "Judas to the cause of anti-Islamism". Could anything worse be said about our staunch defender of 'judeo-christian European values"? Why this is so, we are still investigating. He may be employed by the European Intelligence Agencies, he supposedly acts as a consultant to, or it may be solely due to him selfishly pursuing his own political career. There may be a more sinister reason, but we don’t actually know because he hasn’t had the guts to tell us. Udo Ulfkotte has declared he intends to start and lead a political party to combat Islamism. We believe he couldn’t lead a starving donkey to grass. He is a director of Pax Europa. Well, we believe he couldn’t direct a drinking straw into a bottle. A denunciation of the political and personal impotence of Ulfkotte, that should merit another alert of the prosecution by Pax Europa! He is nothing more than a saboteur who is doing no favours for the people of Germany, let alone Europe. In our opinion he is a pathetic coward and German people would be best advised to avoid him and his future political party, unless they wish to endure an existence under Sharia law. Well, Ulfkotte sued people for less. For instance, he wants to fine Watchblog Islamophobie-author "bigberta" with more than 60.000 Euros, merely for linking to a blog, where Ulfkotte was qualified as a "racist". If Mr. Ulfkotte and his Pax Europa Organisation are interested in giving proof of the fact that their juridical actions are not exclusively oriented at people whom they consider as their political enemies, but that they are seriously engaged in upholding European civilized values on the Internet, they know now what they have to do. They know, that, if they let pass SIOE's incriminations without reaction, their chances in court against the German bloggers who warned against Ulfkotte, become very tiny. Which other errors did he admit during the break near to the end of the movie? Maybe, he mentioned his expensive and futile lawsuits against German bloggers, who warned the public against him and his "errors"? We will never know. We found the YouTube film on the excellent "Yelloman" blog ("Extreme Right in Flanders - weblog against hate and racism"). [In Dutch/Flemish]. 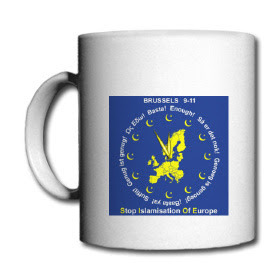 Yellow is the favourite nationalist Flemish colour. And "yell" indicates the way in which the Vlaams Belang usually prefers to communicate. Today, the same Blog was extremely quick in posting images of the Vlaams-Belang dominated former Ulfkotte manifestation in Brussels. The announced 20.000, plus 10.000 people from North America and Asia that Ulfkotte announced repeatedly, were shrunken to a mere 200, fifty of whom were arrested. Vlaams Belang leaders Dewinter en vanhecke were among those. I publish that movie (in Dutch) today in In Europa Thuis. Is this a bad joke? 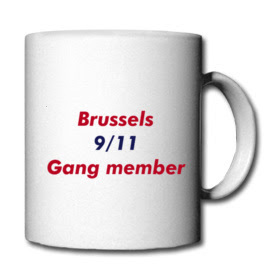 Have another "gang" come up to disturb the German Dr. Ulfkotte's peaceful and civilised plans for September 11 in Brussels? Or Cologne? Or both? Fact is, that Ulfkottes Pax Europa Website links to a Leipzig store, where, under the exclusive responsibility of himself, anti-islamist "gang"-distinctives are being sold for exorbitant prices. The Web is a jungle. 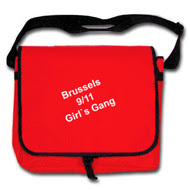 Some hackers could have done, what Ulfkotte's allies like "Pro Köln" and "Vlaams Belang" did, in organising their own parallel demonstrations op 9/11 in Brussels and in Cologne. Whatever - if it is a joke, it is a good one! You think this is not value for money? Yes, the baggy is expensive. And delivery costs have to be added. But you have to remember, that Pax Europa needs money badly. Their lawyers ask every time for more. For instance, in procedure against a blogger who only linked to a site where Ulfkotte was characterised as a "racist". Mit einer Bestellung in diesem Online-Shop geht der Besteller ausschließlich einen Vertrag mit der sprd.net AG [Wer sind das? HR] ein, nicht jedoch mit dem oben stehenden Shop-Betreiber. Für die Bestellung gelten ausschließlich die AGB der sprd.net AG. "In ordering something at this online-shop, the orderer enters only into an agreement with the sprd.net Ltd, and not with the managers and owners of this on-line shop." We continue our window shopping tour at Dr. Ulfkotte's souvenir shop. Do you like pins? - Here is one! No, it doesn't show President Bush adoring an oil barrel, stupid! Dr. Ulfkotte presumably meant a Muslim, praying at a gas dispenser. But, more subtly, one could subsume a link to Dr. Ulfkotte himself. As an Africa-correspondent for the Frankfurter Allgemeine Zeitung during the nineties, he was accused of accepting bribes from oil-company SHELL. However, this accusation was invalidated, when the FAZ won in court against the accusers. Ffünf Stück für nur 5.80 €, zzgl Versand! Die feine Humor des Dr. Ulfkottes (Verantwortlicher für die Gestaltung) ist unwiderstehlich! 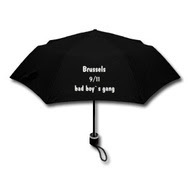 And don't forget your umbrella, "bad boys": 13,40 €! 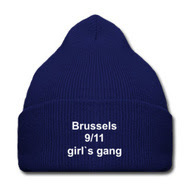 For the girls, no not a headscarf, but this woollen cap: € 13,40! Oder eine kleine Börse? - Nur € 20,10 (zzgl Versand)? 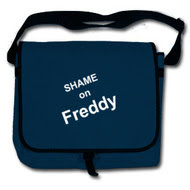 The same handbag, but now with an inscription against "Freddy" (Thielemans), the Brussels mayor? 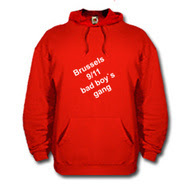 - Only 20.10 Euros, delivering costs to be added! Dr. Ulfkotte did not forget about you, beer and wine drinkers! 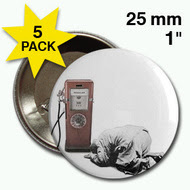 Only 15.90 € apiece!! "Do I resemble a hooligan? ", Udo Ulfkotte asked the journalists, when, on August 17, he was found in Vlaams-Belang-leader Philip Dewinter's parliamentary offices, talking with that extremist in person. Indeed, the gang leader had dressed as a "Hochschullehrer" (professor) for that occasion.